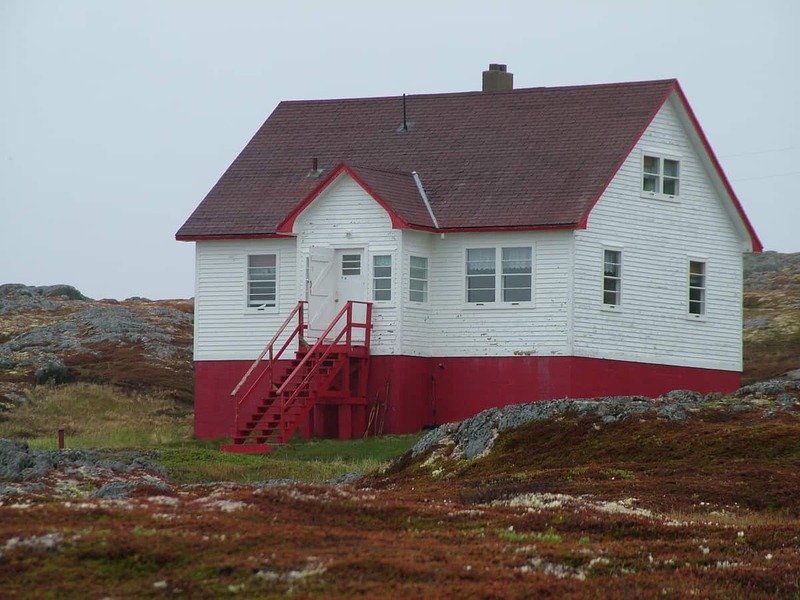 When Bob and I set off from Quirpon, a picturesque village on the northern tip of the Great Northern Peninsula of Newfoundland in Canada, it was to Quirpon Island that we were headed for a stay at the Quirpon Lighthouse Inn. 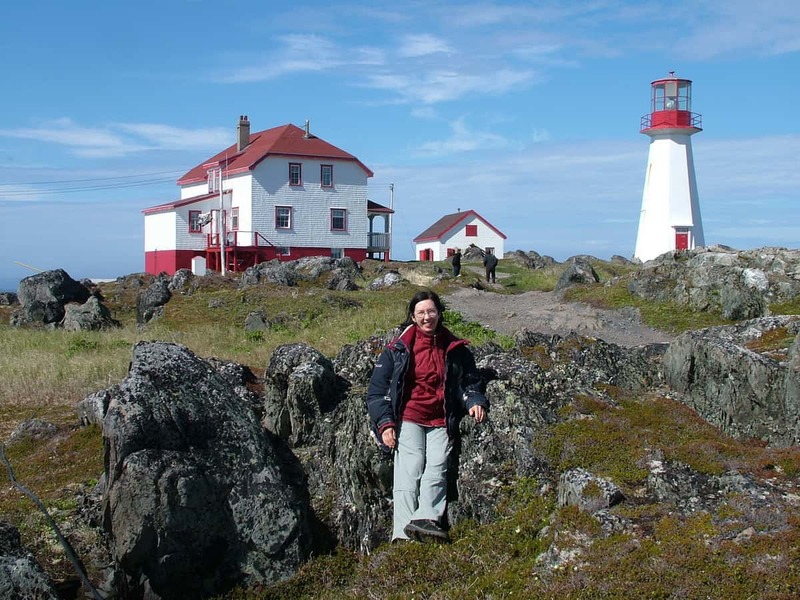 while other guests stayed in the original Lightkeeper’s home. 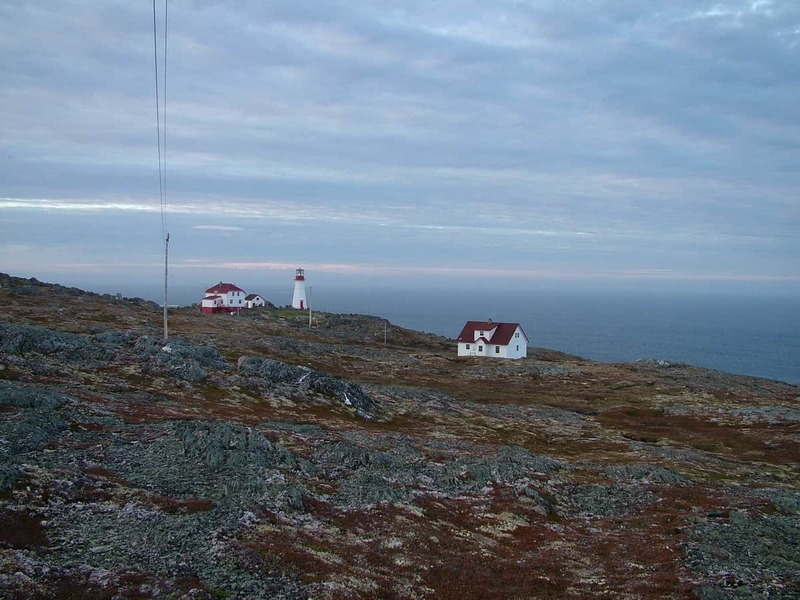 The lighthouse next to the Lightkeeper’s home on the island is from the 1860s, it was automated in the 1990’s. 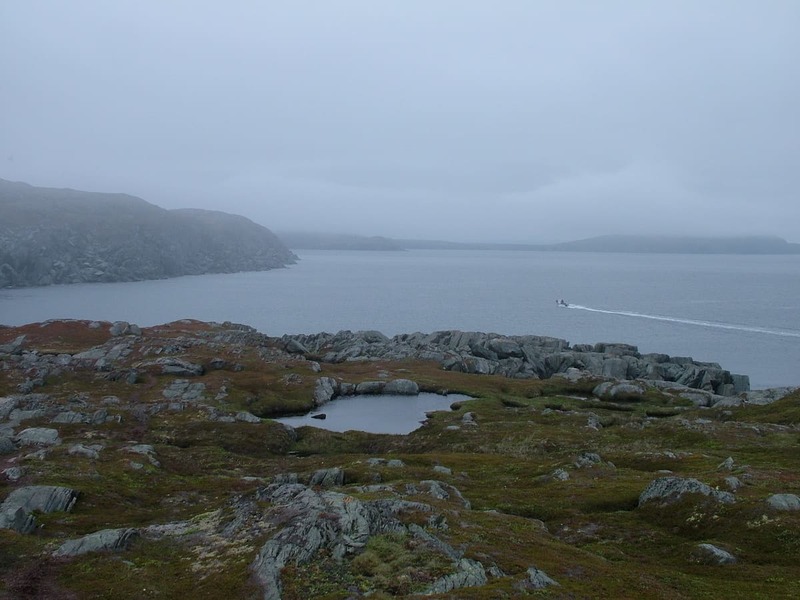 something that became only too evident as we pulled into a sheltered cove to disembark. 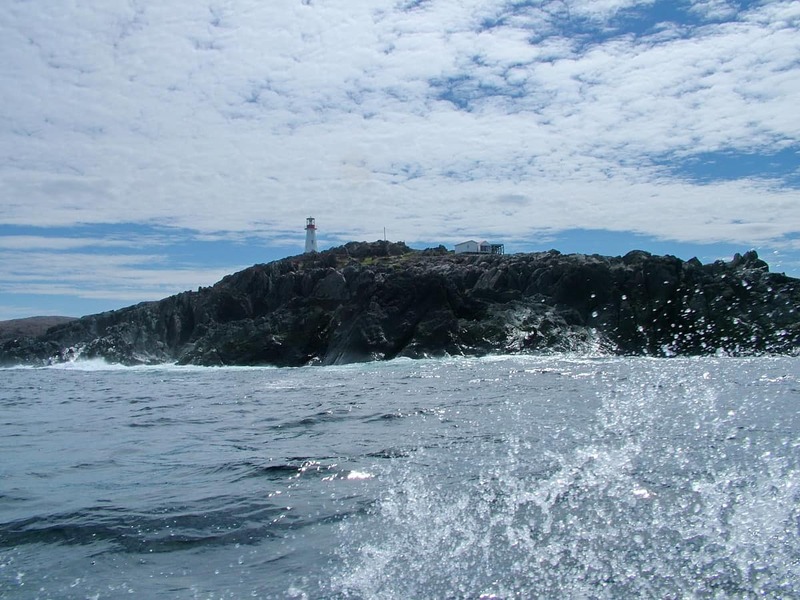 Towering cliffs of black igneous rock rose from the water to a height of 200 feet. 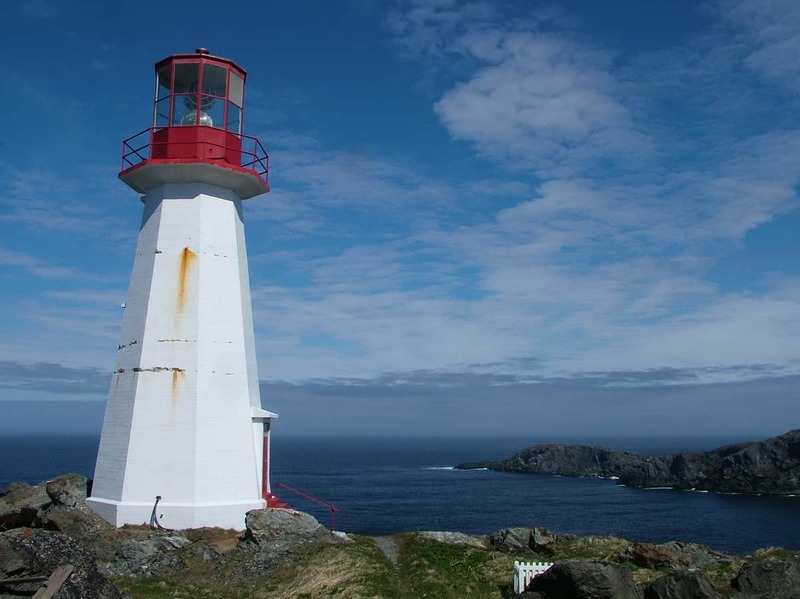 Over the course of a couple of days, Bob and I hiked extensively to discover various notable remnants pertaining to the island’s history. 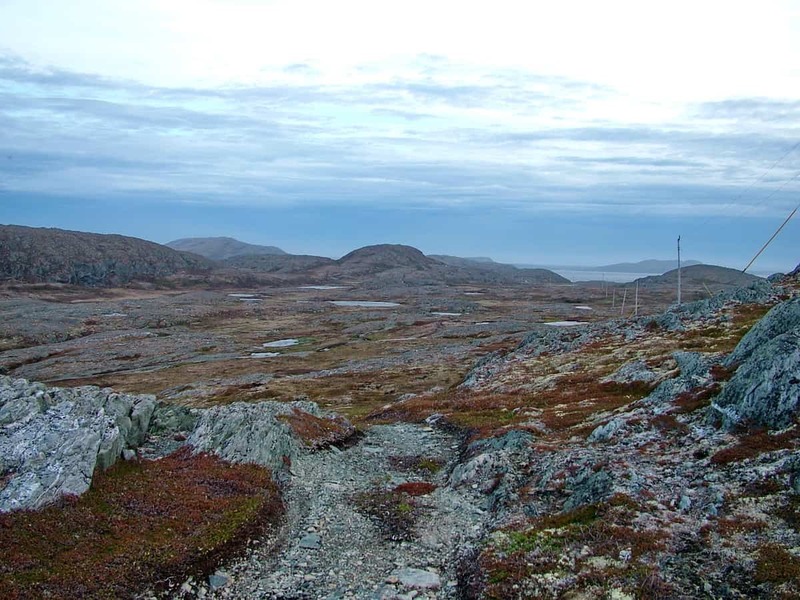 to broad stretches of bog and peat. 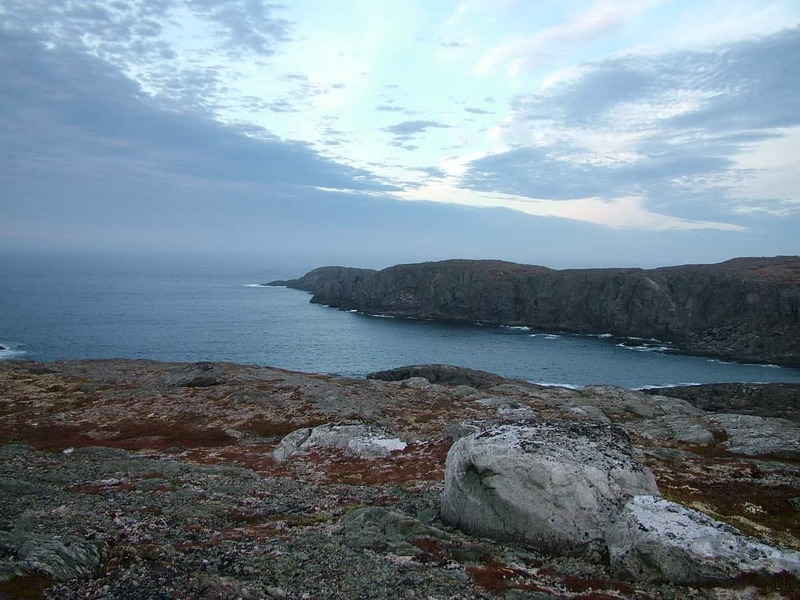 Being located in the north Atlantic Ocean where inhospitable conditions reign, Quirpon Island surprisingly has suitable habitat for quite a variety of plant life. 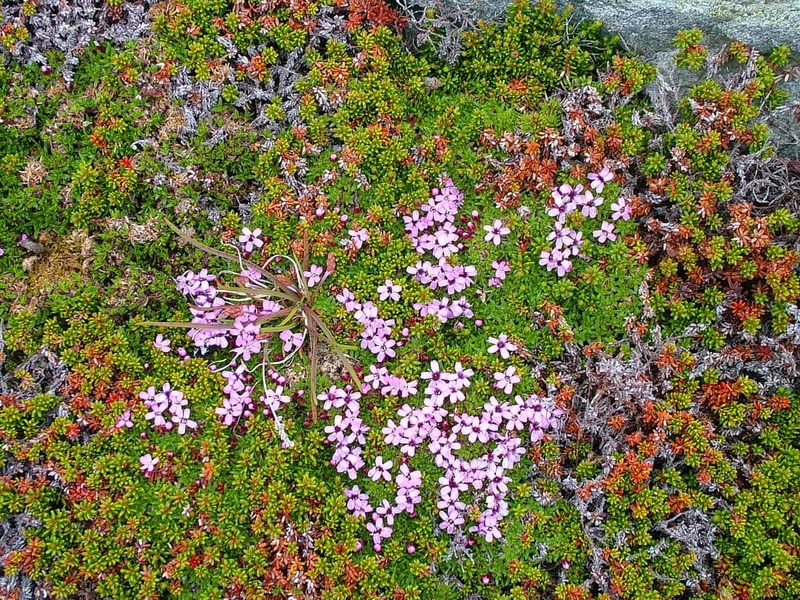 Ponding of water in depressed areas of the plateau provides the necessary fresh water required to sustain plant life in a place where there is little soil to hold moisture. 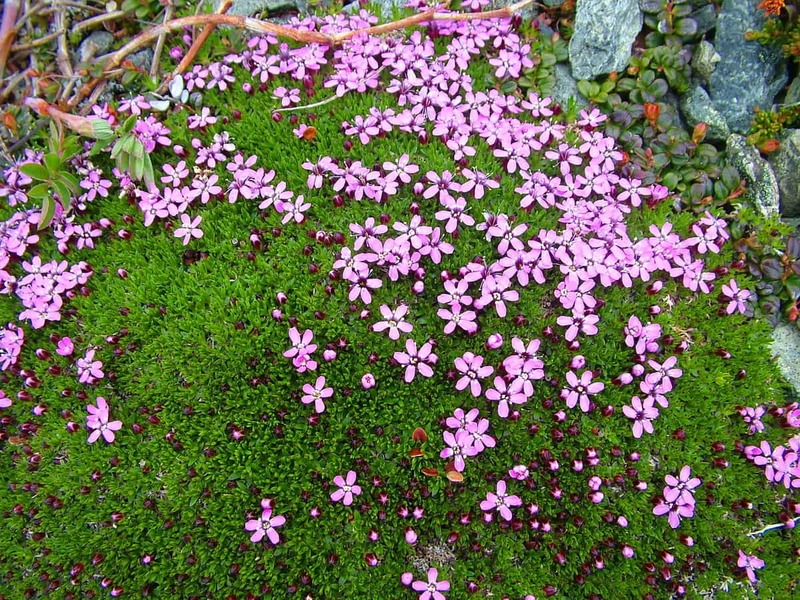 Bob and I were delighted to find mounds of Moss Campion that brightened the grey landscape with its vibrant pink blossoms. 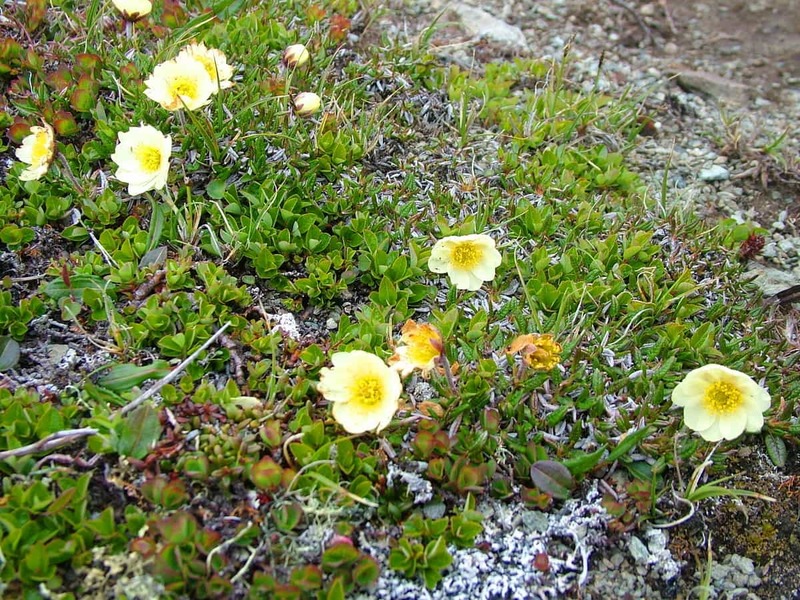 This dainty wildflower is commonly associated with mountain habitat in the high Arctic and tundra. It is also called Compass Plant because it blooms first on the south side of the cushiony mound. 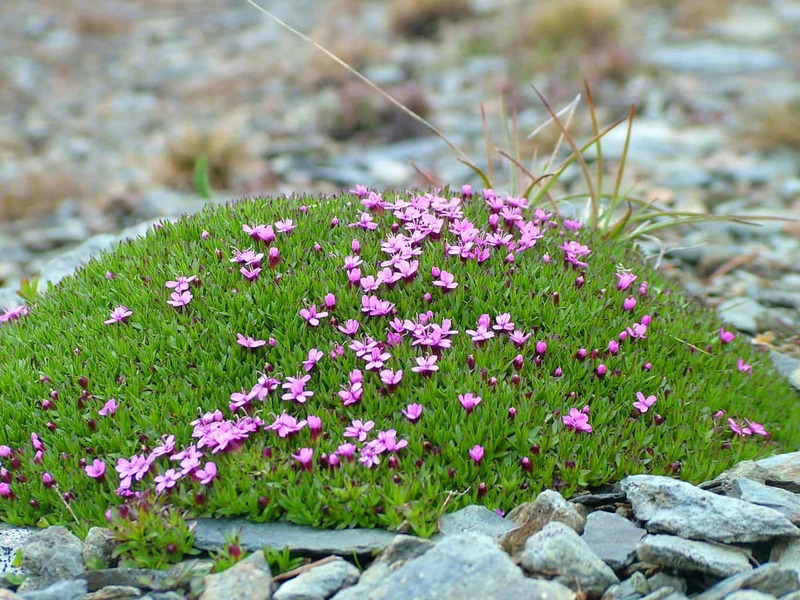 Moss Campion is actually capable of creating its own warmer climate by retaining heat from the sun deep within its cushions. 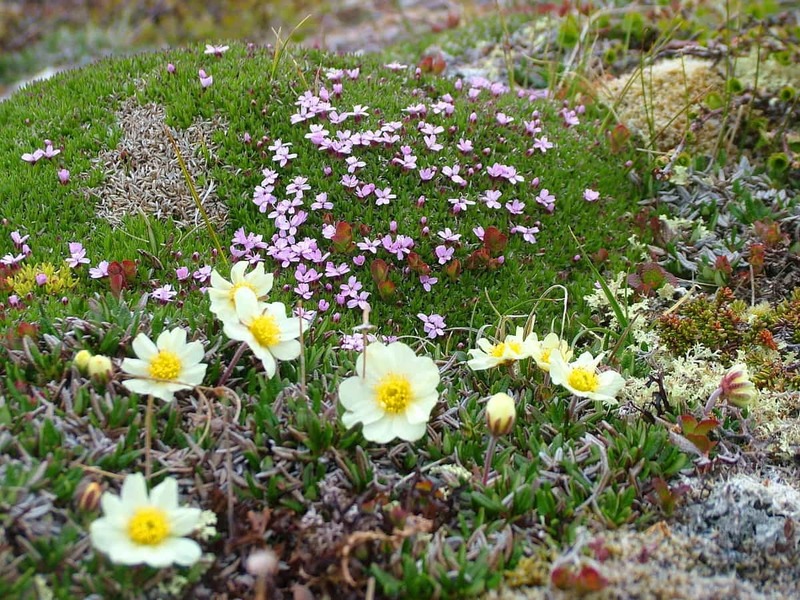 Sharing the nooks and crannies with the Moss Campion were these delightful Northern White Mountain Avens, another species of alpine flower. 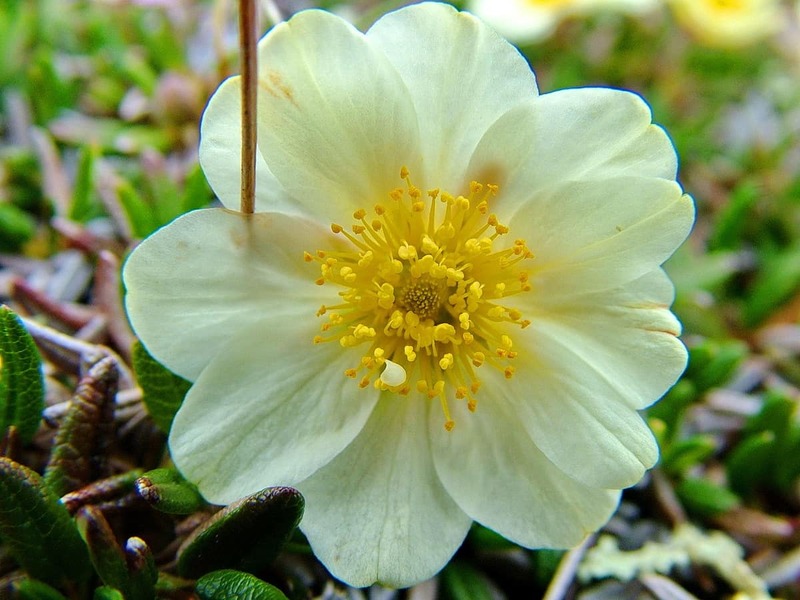 A member of the rose family, Northern White Mountain Avens is usually white but also can be found in shades of yellow and cream. 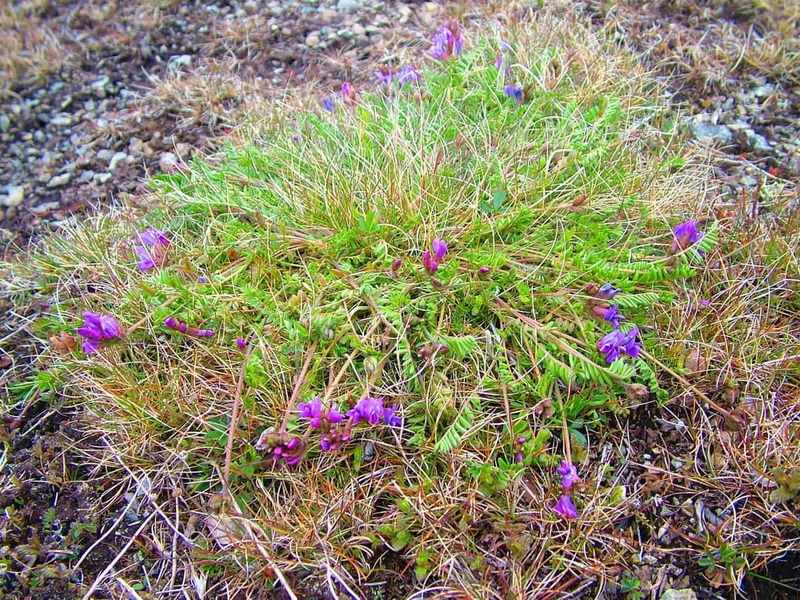 This diminutive plant is actually a dwarf shrub with stems that branch along the ground. 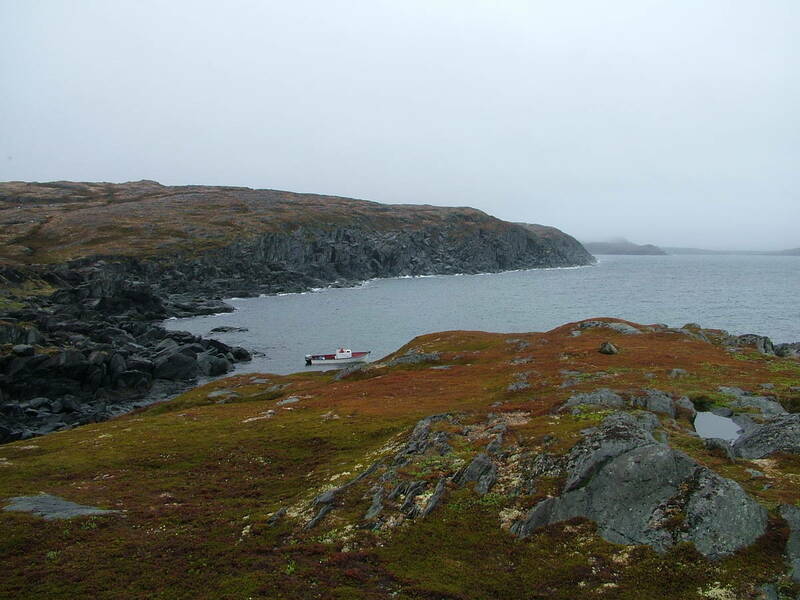 It is capable of anchoring itself securely even in gravelly conditions and thrives in cold, wet habitat. 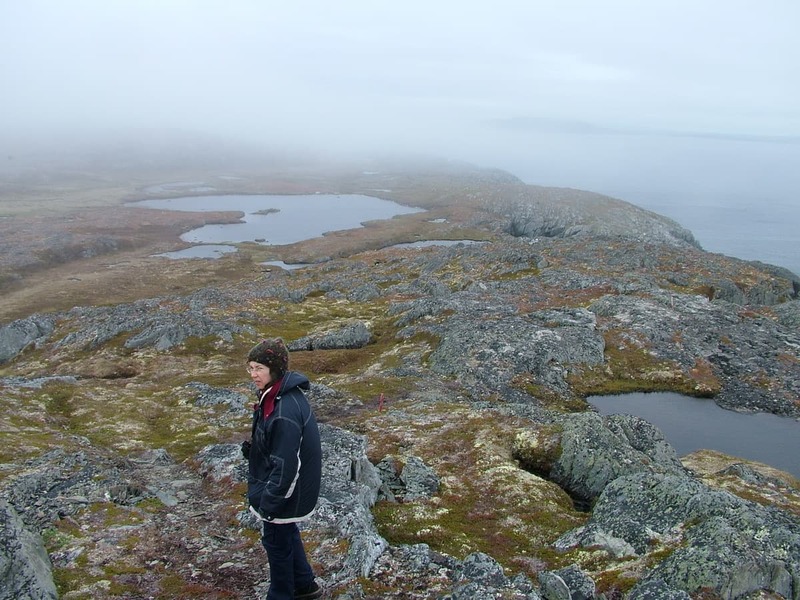 Bob and I traversed Quirpon Island from one end to the other though it required great attention to the challenging topography. Add to that the fact that, even when the sun shines, one can experience four seasons in one day. 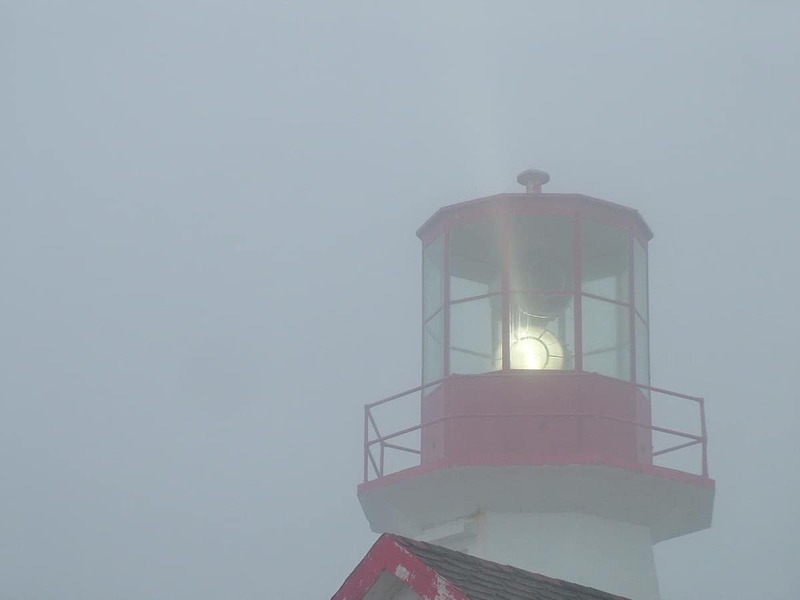 Our biggest concern was being engulfed by a heavy bank of fog should one suddenly sweep in over the island. We also had to be mindful of the peat and muskeg in the bowls of the plateau. 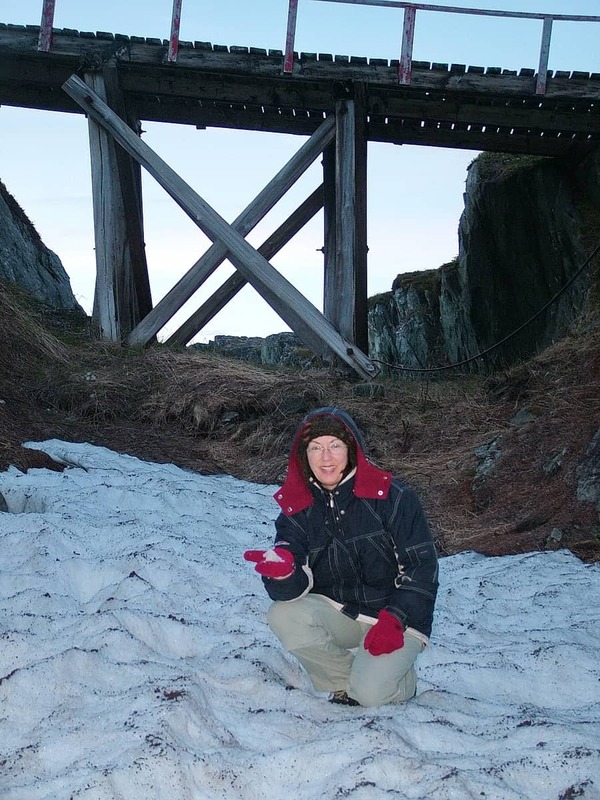 The terrain in those depressions was so spongy that our boots sunk a good 12 inches with each step taken. It was akin to walking on thick foam. 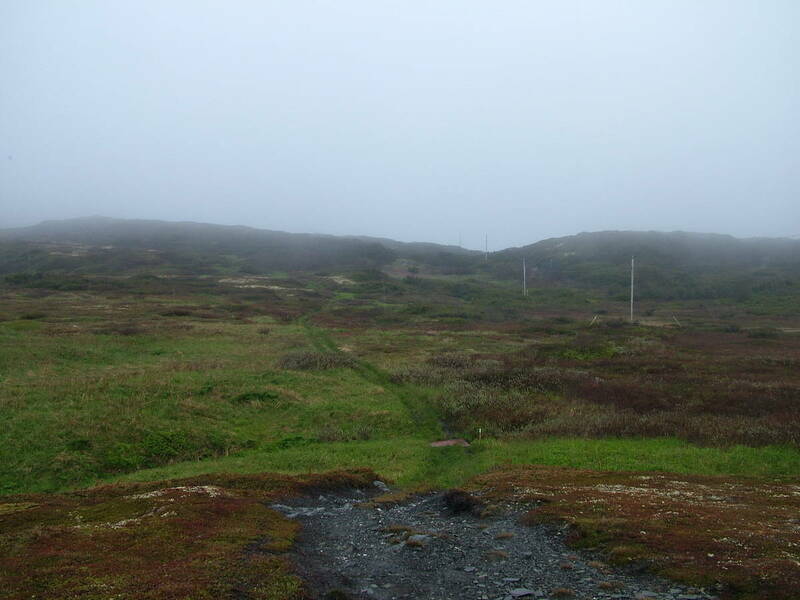 The boggy conditions gave rise to many patches of Newfoundland Oxytrope that seemed to thrive in the harsh environment. 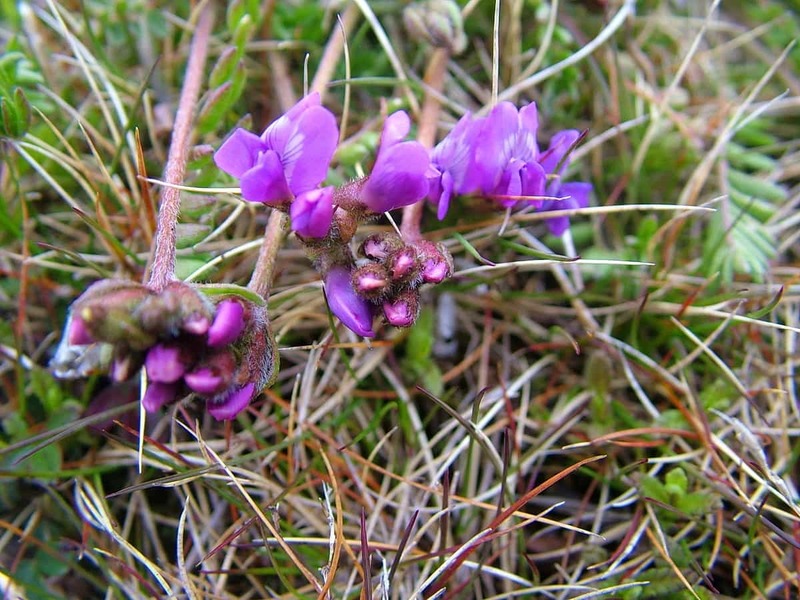 This pretty magenta-coloured flower is a member of the pea family. 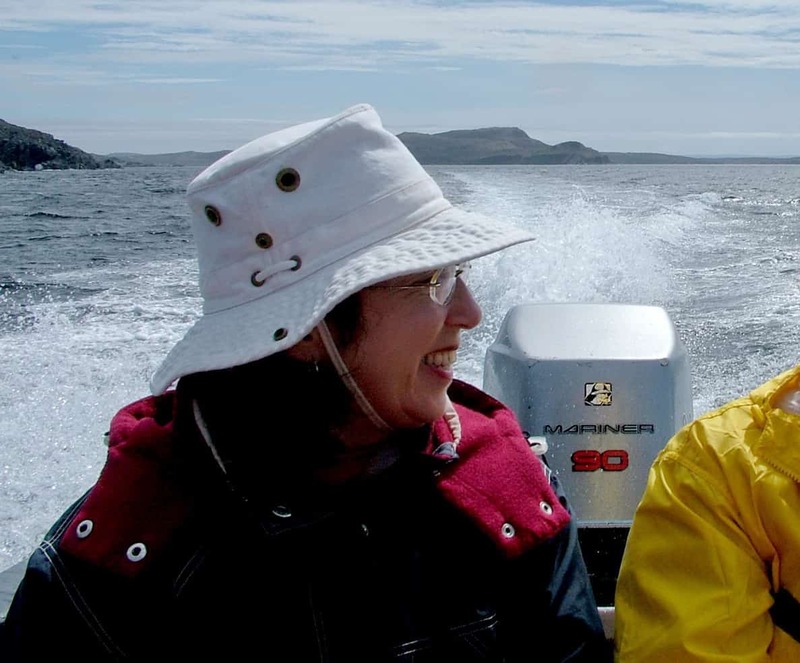 It was a Mausey Day when we hiked from the Lightkeeper’s Station to Grandmother’s Cove where we would board the dory taking us back to the mainland. 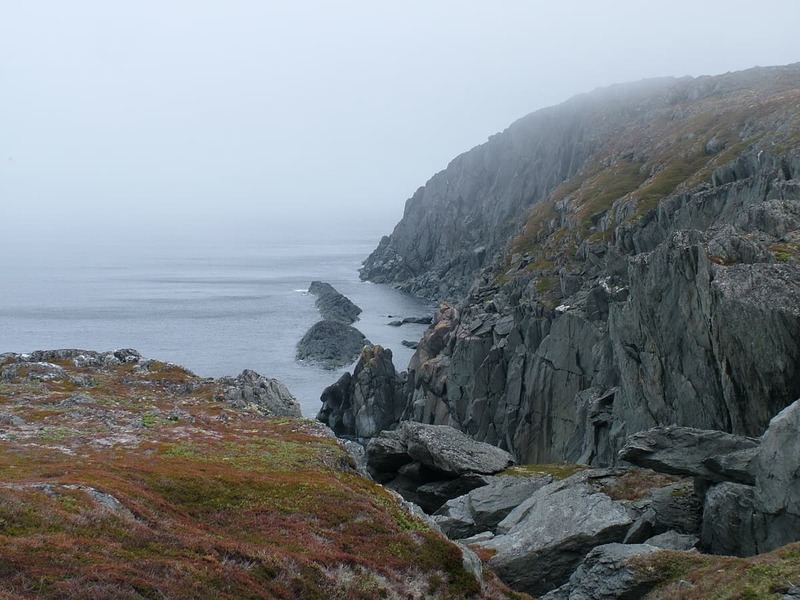 A Mausey Day is a Newfoundlander’s way of describing a damp, foggy, misty day with a light ocean breeze. 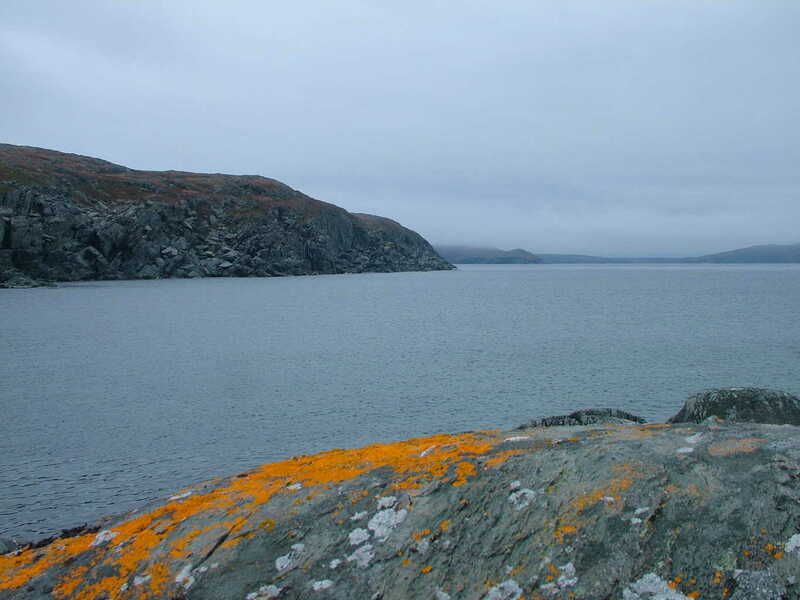 Like spotlights, brilliant orange lichen brightened the surfaces of drab grey rocks near the edge of the cliffs and made up for the lack of sunshine. 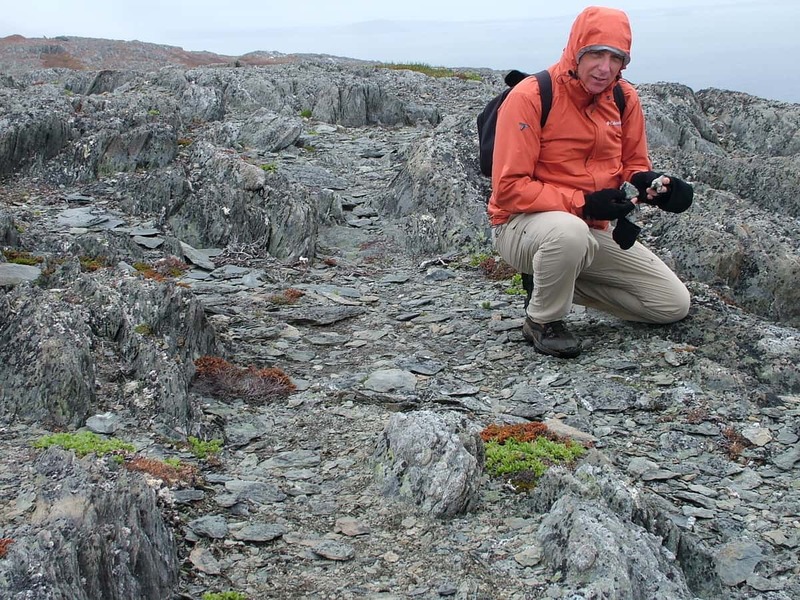 This type of Crustose Lichen strongly adheres to the rock upon which it grows, but it does not have roots with which to absorb nutrients. 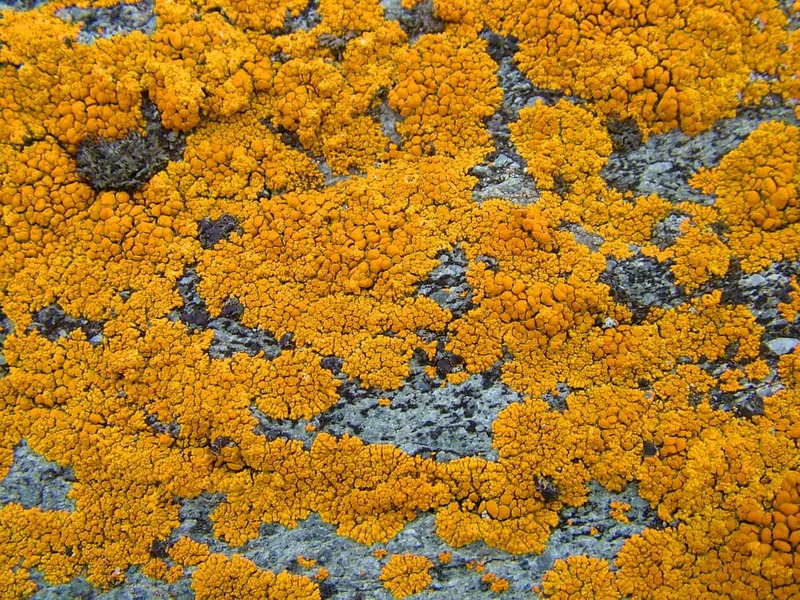 Also called Orange Sea Lichen, it can range in colour from orange to reddish-orange. 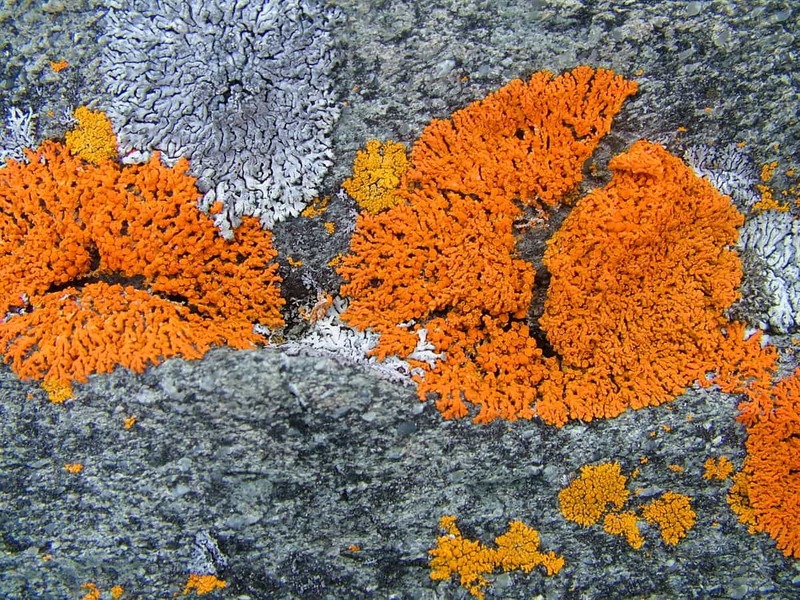 It is found in coastal areas where salt spray and even mild amounts of sea water actually benefit the lichen. 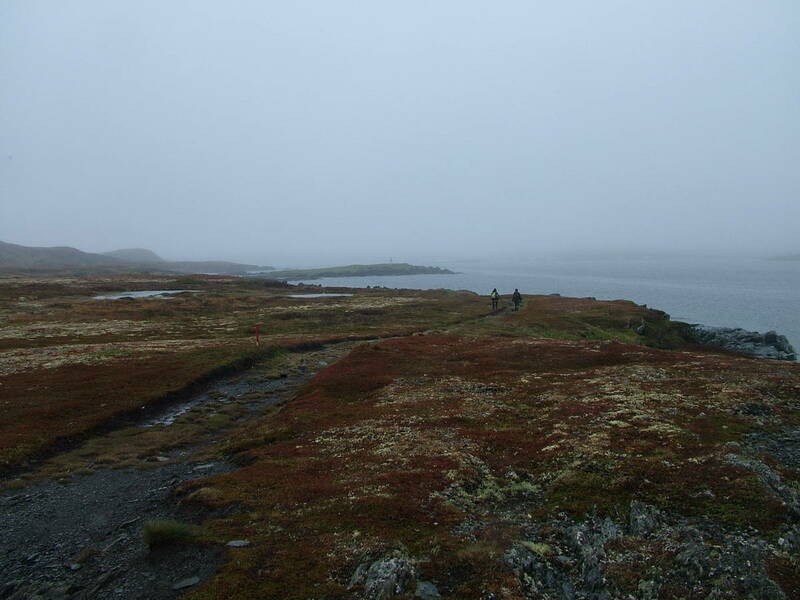 A couple of hours later, we were met by the pilot of the boat who had walked inland to meet us. Calm seas gave us a smoother ride back to Quirpon, the small village from which we had set sail two days prior. 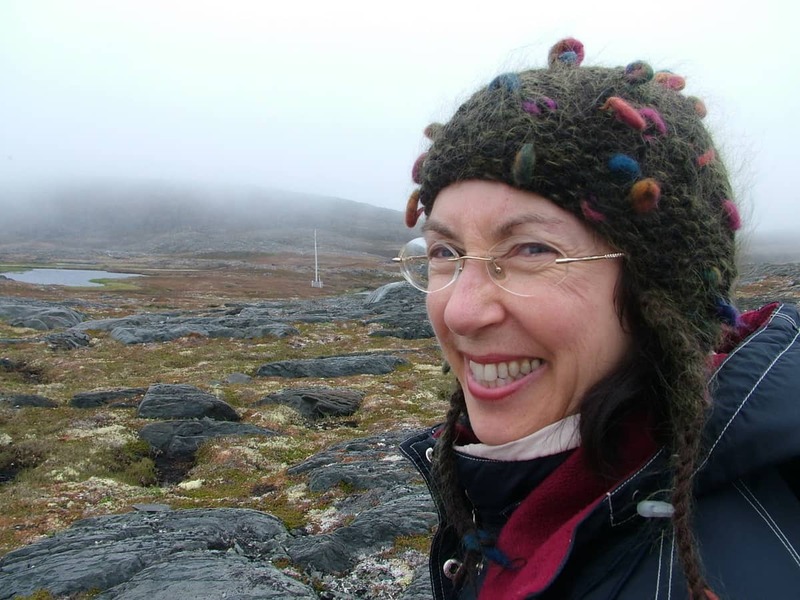 Our time on Quirpon Island had been well spent.